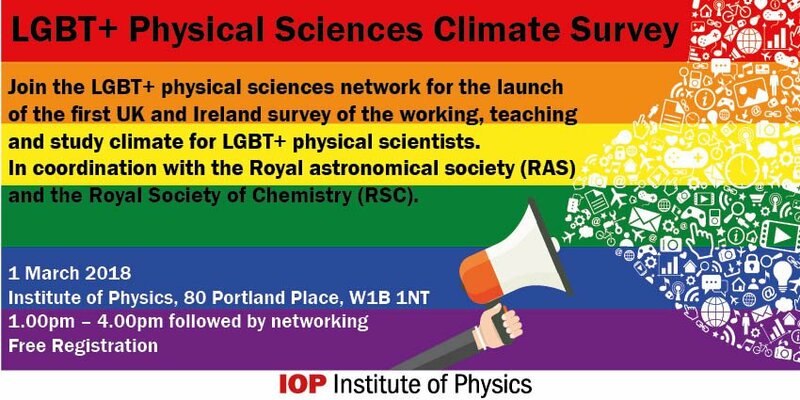 This event celebrates the launch of the LGBT+ physical sciences survey, the first UK and Ireland survey of the working, teaching and studying climate for LGBT+ physicists, astronomers and chemists and those in related sciences. Speakers from the community will be sharing their perspectives on the successes and challenges of creating a climate that enables everyone to be fully themselves in the workplace and place of study. The event is also an opportunity to find out more about the survey and meet other members of the network at an informal reception with drinks and snacks. I am greatly honoured to have been asked to give a talk to introduce the event and chair the session, which ends in a panel discussion.The event is open to all, but space is limited at the venue so you will have to sign up if you want to go. You can sign up here. This entry was posted on February 13, 2018 at 3:38 pm and is filed under LGBT with tags Institute of Physics, LGBT+ Physical Sciences Survey. You can follow any responses to this entry through the RSS 2.0 feed. You can leave a response, or trackback from your own site. I wish everyone involved all the best! At first reading, I thought ‘What do we need a climate survey for? The facts have been know for 20 years.’ Second reading gave ‘Why does it make a difference who does the survey?’ Than finally the brain kicked in (it was a bit early in the morning) and I got it.